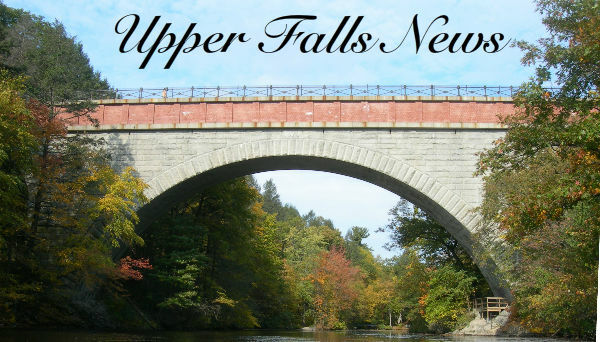 The Upper Falls News is an email newsletter about what's going on in our village. The Upper Falls News is brought to you by the Upper Falls Area Council but it's intended to cover any and all news in the village. Upper Falls Trivia Question - What seasonal product did Upper Falls provide to the City Of Boston for years in the 1800's? Why Am I Suddenly Getting This? - If you signed up for this year's Feast of the Falls and were not previously on our list we added you. The Upper Falls News is the best way to hear details about the Feast as well as anything else happening in the neighborhood. We Do Love Those Upper Falls Eggs - This Sunday bring something to contribute to breakfast and bring some chairs. We'll provide the eggs and bacon - not just any eggs but 100% high altitude Upper Upper Falls eggs from the heights of Cottage St - "where the air is thin and the chickens like it that way". It's the 2nd annual Eggcellent Breakfast at 10 AM just below Echo Bridge on the Newton side. We'll be firing up the fireplace and griddles. Everyone is welcome. Send us email and let us know what you're planning to bring. Our Falls farmers Julie Irish and Dean Whitney will be providing the Upper Falls eggs and for those who prefer more exotic imported eggs, we'll also be serving some Nonantum eggs from the flock of Megara Bell & Brian Flaherty. You decide who's got the best eggs. Is it those robust eggs from the northern climes of Nonantum or the Falls favorite high altitude eggs. Egg trash talking welcomed. BAM! They're Gone - The tickets for the 2nd annual Feast of the Falls were handed out last Sunday starting at 5 PM and they flew out the door. At this point we have a substantial waiting list. We'll be handing out some additional tickets to the waiting list in the weeks before the event. If you already received tickets and your plans change - BE SURE TO RETURN YOUR TICKETS so that we can pass them on to the folks on the waiting list. We'll try to accommodate as many people as we possibly can. Feast For The Rest of The World - The vast majority of the Feast of the Falls tickets are reserved only for Upper Falls residents. We did set aside 20 tickets to be sold via an online auction that ends next Sunday June 8) at 5 PM. Anybody from anywhere can bid on those tickets and buy their way into our Feast. So if you have friends that want to join the party, point them to the on-line auction. We'd love to get those tickets bid up to ridiculous levels but at the moment they're at bargain prices. Check out the auction here. Bulging Biceps - Betsy Hewitt and her daughter Lydia took up an unusual hobby in recent weeks. They heard that we were hoping to find some more leftover railroad spikes and hardware on the Upper Falls Greenway right-of-way. We've been talking to a local craftsman at Hammersmith Studios, about possibly building a steel sculpture for the Greenway and might be able to integrate some of this railroad history into it. Betsy and Lydia have been scouring the hidden corners of the right-of-way and been collecting and delivering batches of spikes to us over the last few weeks. So far they've collected, shlepped, and delivered 81 pounds of steel to our backyard. Historic Preservation in Upper Falls - Area Councilor and longtime member of the Upper Falls Historic Commission Nina Kochs wrote this thoughtful essay on why the history of the village is important to preserve and how you can help do it. Sign up for Tour de Newton too - The 2nd annual Tour de Newton will be held on Father's Day, June 15. It's a great event for kids, adults, and casual bicyclists. The ride starts simultaneously in all 13 villages. You'll be riding with your Upper Falls neighbors and have a trained leader and sweep to guide you. The 20 mile, 13 village fun ride stops at each of Newton's villages, where you'll be welcomed with refreshments, a village badge, and an overview of the village by the locals. Ride the whole 20 mile loop, or just a few villages, whichever you like. It's a great fun way to see and learn about the whole city. Registration is limited and filling up fast, so sign up here today. Did You Know ... that according to Ordinace #69-1 in Skamania County, Washington, it is a misdemeanor to kill Sasquatch ? "Did You Know ..." features an interesting and random fact every issue, collected by 6th grade Upper Falls resident Ian Wittler. Upper Falls Trivia Answer - The short answer is "fireworks". The long answer is from the 1889 King's Handbook of Newton - "On Needham St. near the railway, are the buildings of the United States Fireworks Company, from which the great Fourth-of-July pyrotechnic display of the city of Boston have been furnished. To avert the danger of a general and disastrous explosion, the operations of manufacture are carried on in a number of small detached buildings, scattered at random through the forest. The "Needham St forest" isn't a phrase you hear uttered much these days. The railroad they mention is of course the same railroad line that will soon become the Upper Falls Greenway. Fittingly, all purchases of the 1889 King's Handbook of Newton today now go to benefit the Upper Falls Greenway project.